or so Hubby has started to think. He asked the other day, “Are you going to put basil in everything now?’ Good idea, I thought. But the continuing heat has me SO lethargic (along with the frequent trips back and forth across Texas lately)! Yesterday was a good day to not turn on the stove…again. So we did dinner a la snack! 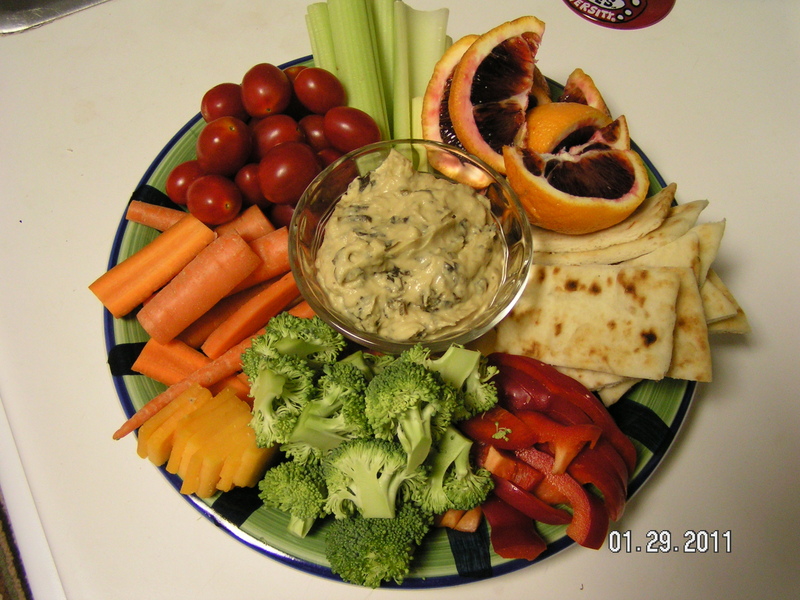 Veggie goodness, with a bit of cheese and hummus for protein. I happen to LOVE blood oranges, though I can’t get them all the time here. Hummus is actually the Arabic word for chickpea. They’re also called garbanzo beans, which is Spanish, or cece, which is Italian. I like to serve hummus with naan for dipping. It’s kind of Indian flatbread. Dots, not feathers. You can also go with pita, which is almost as good. Heat it in the oven, or toaster oven if you are practicing oven avoidance. It’s even better still warm! You know what? My basil is STILL fresh! I love it!! !